Winners of the 2019 Washington DC Youth Tour Essay contest were Lilli Colburn, Butler and Miles Bailey, Clinton. They will attend a week long, all expense paid trip to the nation’s capitol in June. McKenna Mason, Clinton and Ciara Stricker of Cleveland were selected to attend the Cooperative Youth Conference and Leadership Experience (CYCLE) to be held in Jefferson City in July. The contest was open to all juniors in th 14 school districts within Osage Valley’s service territory as well as home and private school stundents. Contestants were required to write a 1-2 page essay about something they are passionate about. Four finalists were selected from the essay entries for an interview with a panel of judges. The school district of each finalist will receive a $500 grant for encouraging students to participate in the program. High School Juniors! You could win an all-expense paid trip to Washington D.C. June 14-20, 2019. Travel with other juniors from Missouri, and join hundreds of young men and women from across the country in Washington D.C. Visit historic monuments and museums, meet with U.S. Representative and Senators, meet and mingle with students from other states on Rural Electric Youth Day! It is a week you will never forget! High school juniors are eligible if their parents reside within Osage Valley’s territory, but the parents do not have to be members of OVEC. Each contestant is required to complete an application and short essay question. Applications will be reviewed and four finalists chosen for an interview. Two winners will then be selected to represent Osage Valley Electric Cooperative for the 2019 Youth Tour. The two runners up will attend a the Cooperative Youth Conference and Leadership Experience (C.Y.C.L.E) in for three days in Jefferson City on July 17-19. Click Here for an application. The deadline for submitting applications is Tuesday, March 13, 2019 by 12:00 p.m. For more information or to enter the contest, contact: Jana Rosier, Member Services Department, Osage Valley Electric, PO Box 470, Butler, MO 64730. (660)679-3131 ext 5547. 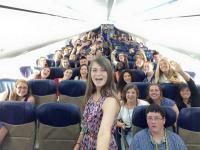 Check out the video of last year’s amazing Washington DC trip!